8 Shaft Capacity - Possibility to learn versatile designs like Dobby, Satin, Sateen, Etc., - "Easy to access levers" for shaft lifting. 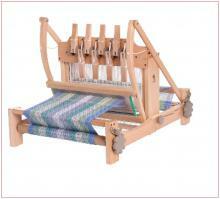 Weaving width 24" (61cms) - Compactly designed to fit smaller space. Overhead Beater - Innovative design to beat the weft perfectly with the fell line. Steel Reed - 1 No. 10 dpi/12.5 dpi/16dpi. Timber - Made of Lacquered Beach Hard Wood - Aged and Treated to stay away from fungal attacks for years. Swedish Texsolv Heddles - Strong & Easy to use and soft on heads during drawing in and adding up additional heddles also possible. Warping Frame - To make 10-11 Mtrs of warp. Supplied with - 2 Nos. stick shuttles, Heddles Hook, Cross & Warp Sticks, Learn to weave on the table loom brooklet, Warping Frame.